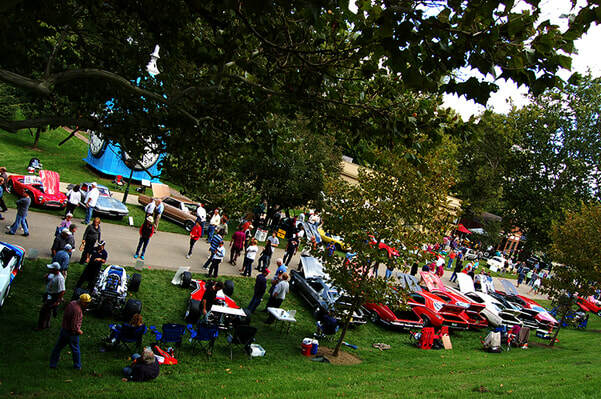 The 2016 edition of the Dayton Concours d'Elegance was a wonderful day for all the great people of Dayton, Ohio and the surrounding communities of car and history lovers. 'Miss Sunoco' was in an unjudged class for previous show winners, while 'Chip's car' did not place in the race car class, and that is A-OK by us. We have had a great year on the Concours circuit, and both cars are going in for a long winter nap. We had an impromptu photo session with some fine gents who knew Chip well during his lifetime. More people came over throughout the day and sprinkled in personal stories of the man, his racing career, and his zest for life. 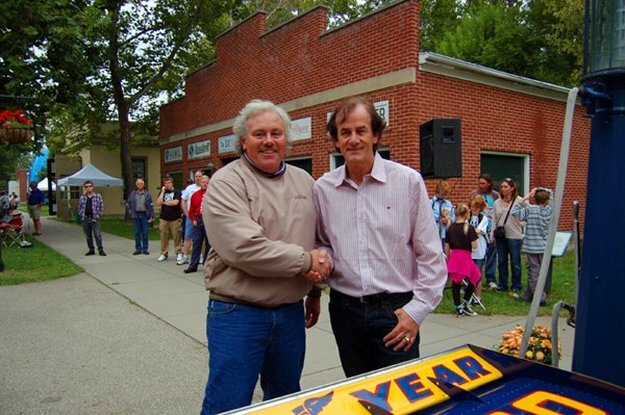 Events like this have made this eight-year trek to restore Chip's car all-the-more satisfying, knowing Eagle #8101 is much more than just a race car. 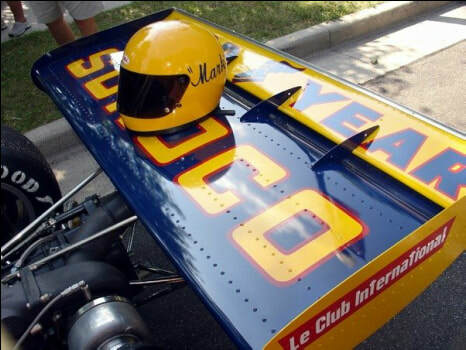 There is something very unique regarding automobiles and the memories they are able to conjure up- even more so for racing machines where a name is often associated with a car. The smiles and the 'I remember when...' stories that came out in full color this weekend regarding Eagle #7225 and #8101 were worth the trip alone. 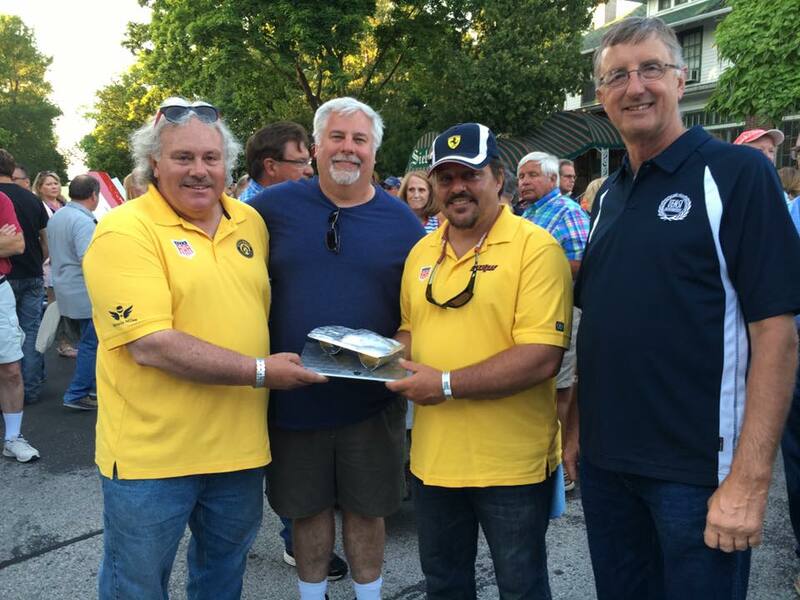 The 2016 edition of the newly-renamed Milwaukee Concours d'Elegance was a wonderful event, benefiting The Autism Society of Southeastern Wisconsin, Boys & Girls Clubs of Greater Milwaukee and Meta House. KMPR was also on-hand for Saturday's 'Show & Glow by the Lake' show, which featured over 300 unique vehicles. Both festivities were held in Veteran's Park along the shores of Lake Michigan, just north of the Milwaukee Art Museum and War Memorial buildings. After unloading the three Eagles Sunday morning, the team had just 90 minutes to prep all three cars, as well as 'Big Blue,' which served as a billboard for the event. 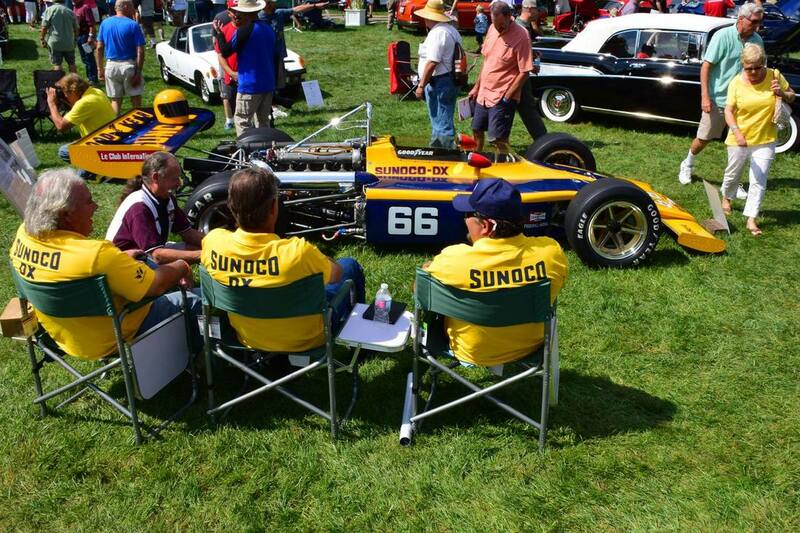 After judging, we weren't sure whether we'd even crack the top ten given the quality of cars that were entered, but were very pleased to have 'Miss Sunoco,' aka 1972 All American Racers Indy Eagle #7225 take 'Best in Class' honors for Race Cars. The event was very well run and allowed some friendly guidance along the way to help us out with our mammoth four-vehicle effort. Our class win this weekend is in memory of our dear friend Dennis Grace, who would have probably kidded us that if we could do what we did logistically with four vehicles today, how about eight next year...you're forever be in our thoughts Dennis! 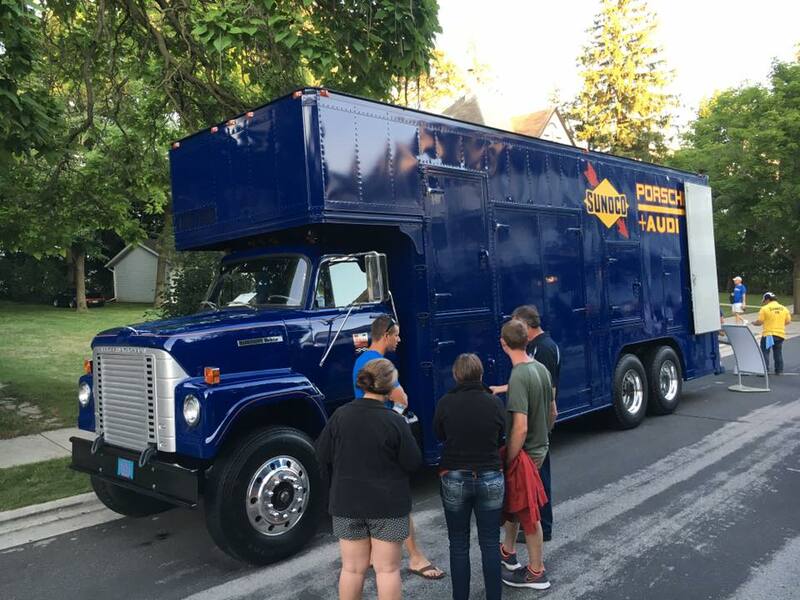 The KMPR squad was all over Elkhart Lake for the 2016 edition of the famed 'Vintage' weekend, as the team entered their 1972 International Fleetstar 2110A transporter in the Nationwide Insurance Concours d'Elegance and picked up a reserve placing against some beautiful machines. 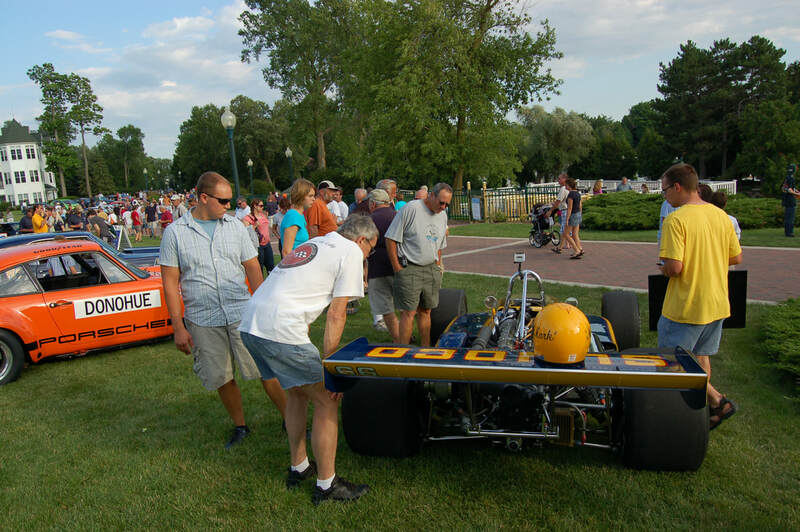 In what was a return to on-track competition for KMPR, the team also competed in the Nationwide Insurance Concours d'Elegance, held on the streets of Elkhart Lake, with their 1968 LeGrand Mk7 #001 Formula A machine. The team also honored their late friend Michael Argetsinger, wearing red socks throughout the weekend. The event helped benefit Dayton History, a historical organization that preserves the history of Dayton through its various historical preservation parks and facilities. On a day where KMPR had two Concours d'Elegance dates in two states, Bob and Andree Mayer presented their 1968 LeGrand Mk7 #001 Formula A car at the Geneva Concours d'Elegance in Geneva, Illinois. The event was open to the public at no cost and was a wonderful setting along Geneva's charming downtown shopping district. The event benefited the Pediatric Programs at Cadence Health and LivingWell Cancer Resource Center. 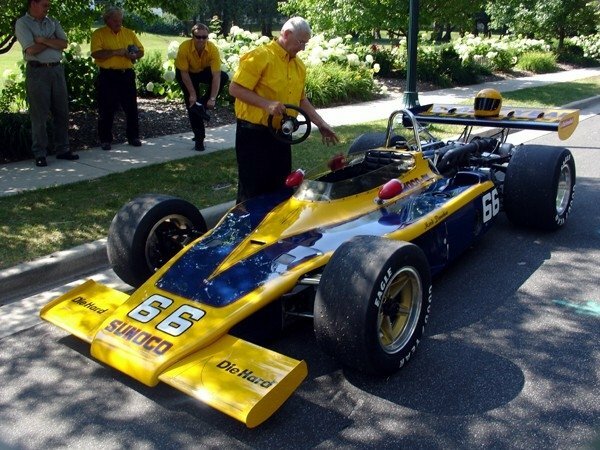 While KMPR's Illinois-natives won their class 97 miles south in Geneva, the Wisconsin branch delivered 1972 All American Racers Indy Eagle #7225 to the The Milwaukee Masterpiece in Veteran's Park along the beautiful shoreline of Lake Michigan. The 2014 event benefited The Autism Society of Southeastern Wisconsin, Boys & Girls Clubs of Greater Milwaukee and Meta House. 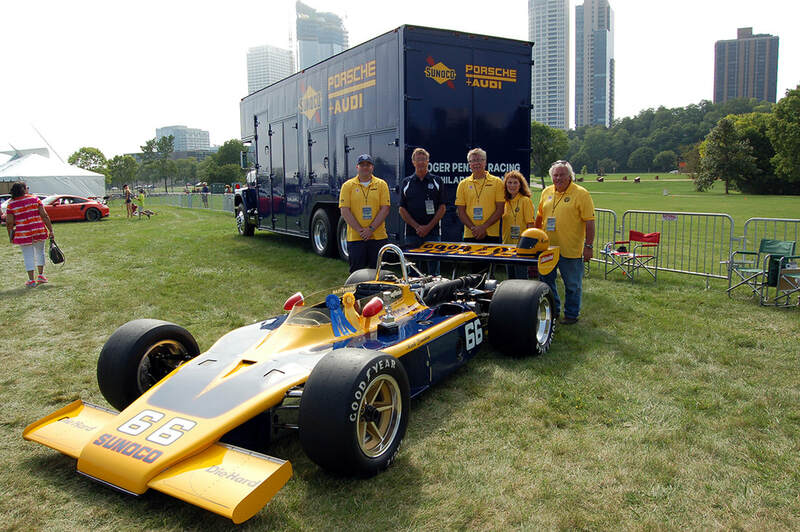 KMPR showed 1972 All-American Racers Indy Eagle #7225 at the 35th annual Ault Park Concours d'Elegance, which benefited juvenile arthritis. 'Miss Sunoco' took home Best in Class honors in the Racing Cars - All Years category, and also captured the third place award in the Hagerty Youth Judging portion of the concours, which was a a great honor knowing the kids the the greater Cincinnati area thought so much of a forty-two-year-old race car. 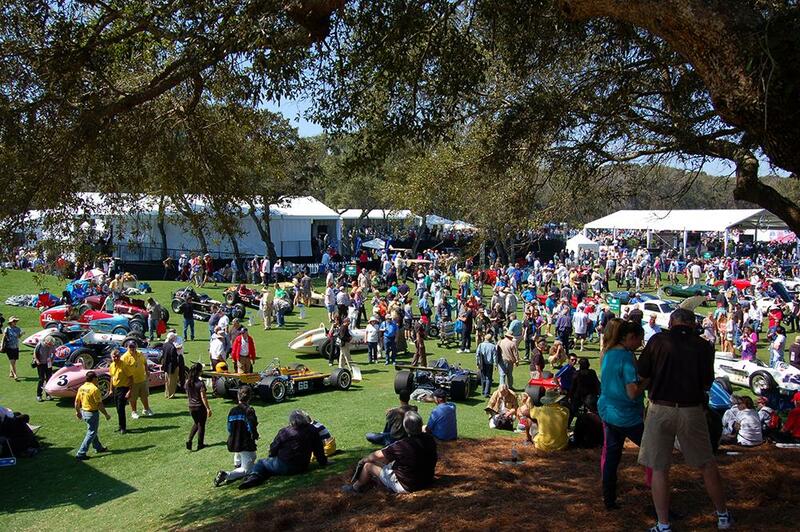 It was a great honor for KMPR to take part in the 2014 edition of the Amelia Island Concours d'Elegance as a participant in the Offenhauser-powered machines class. When judging was finished, 1972 All American Racers Indy Eagle #7225 took home an 'Amelia Award' in its class, which was outstanding considering the legendary cars in the class. The class win went to another 1972 AAR Eagle, #7217, owned by Bruce McCaw. McCaw's machine was the winner of the 1973 Indianapolis 500, and was later raced by Lee Brayton and Mike Hiss. 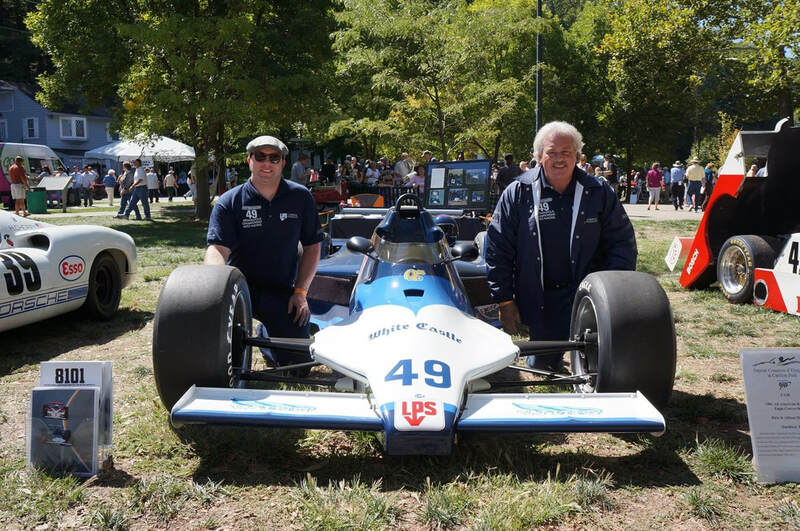 The 2013 version of the Nationwide Concours d'Elegance was the first venture of the newly-joined UMW and Mayer Racing squad. 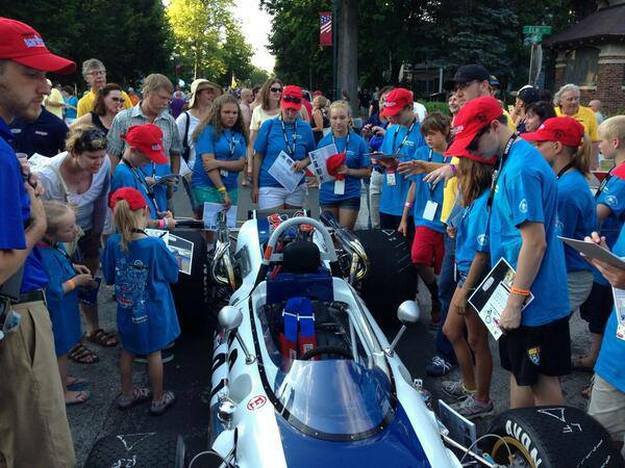 The new team showed 1968 LeGrand Mk7 #001 and 1972 All American Racers Indy Eagle #7225 at the Concours, held on the streets of Elkhart Lake. The LeGrand placed third in Hagerty's Youth judging after showing off its 1968 livery for the first time in 45 years. 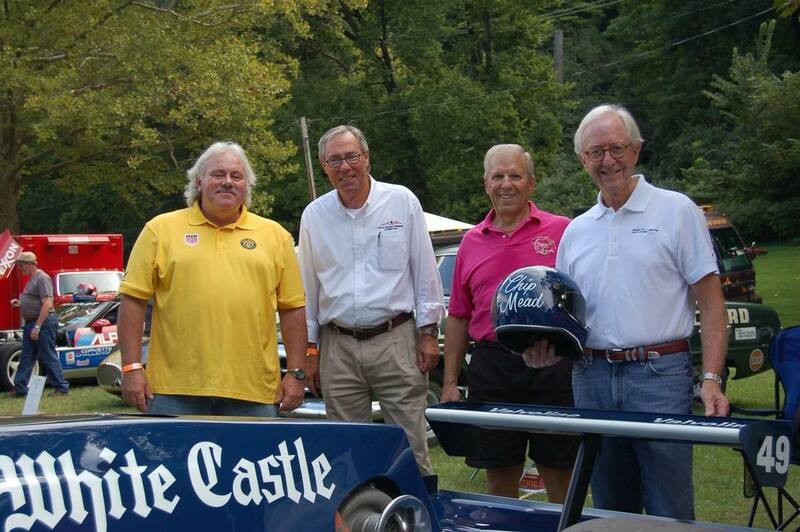 For the first time since the inaugural event, KMPR and their 1972 All American Racers Indy Eagle #7225 made the trek to Barrington, Illinois for the 7th annual Legends & Legacies event. Wewere humbled to take 'Best in Class' honors for the Stars of Indy class. #7225 was then placed in the top four of the 140 cars present for the honor of 'Best in Show,' which went to a very deserving 1934 Avions Voisin C-25 Aerodyne from the collection of the Mullin Automotive Museum. A wonderful day benefiting the Barrington Area Conservation Trust. 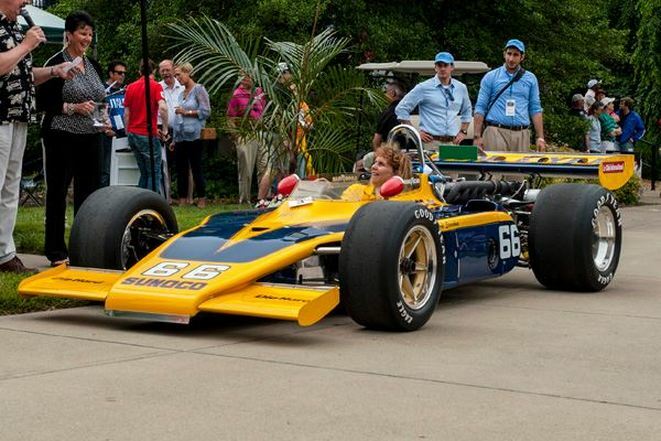 KMPR had a great weekend at Carillon Park for the 2012 edition of the Dayton Concours d'Elegance for the first Concours entry for their 1981 All American Racers Indy Eagle #8101 in the hometown of its original owner/driver, Chip Mead. It seems many on-hand were in awe of Chip and his relentless determination. KMPR didn't rank in the class voting, but we had no expectations for a car that hadn't been seen in 30 years. We were just glad to bring Chip's Eagle home. After judging, #7225 tied with Bill Akin's 1955 Bardhahl Spl. Kurtis 500B-Offy and Joe Freeman's 1915 Duesenburg, but eventually placed third after a second-round of judging took place. The event benefited Brooklawn Child and Family Services. 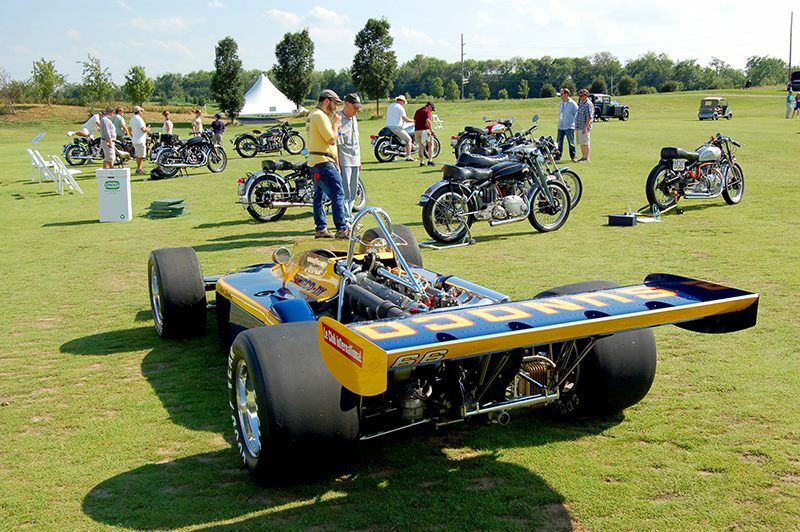 KMPR was invited to Dayton to exhibit its 1972 All American Racers Indy Eagle #7225 at the Dayton Conocurs d'Elegance at Carillion Park, just across the street from the Dayton University campus. We had no clue what an amazing facility Carillion Park is. A great venue, filled with historic Dayton buildings and musuems in a row celebrating the heritage of Dayton. Somehow KMPR came away with a class win for Indy Cars, and then managed to win the prestigious Col. Edward A. Deeds Judge's Choice award. It was an amazing feat considering the fact #7225 had never won an award by itself in its life. KMPR had a wonderful time, and everyone who ran the event did a wonderful job making the event a success for the park and the local charities. 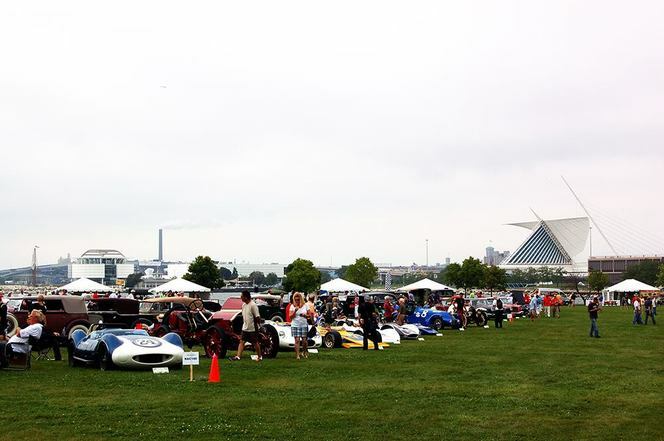 The 2011 edition of the Milwaukee Masterpiece was held at Milwaukee's Veteran's Park along the shores of Lake Michigan. 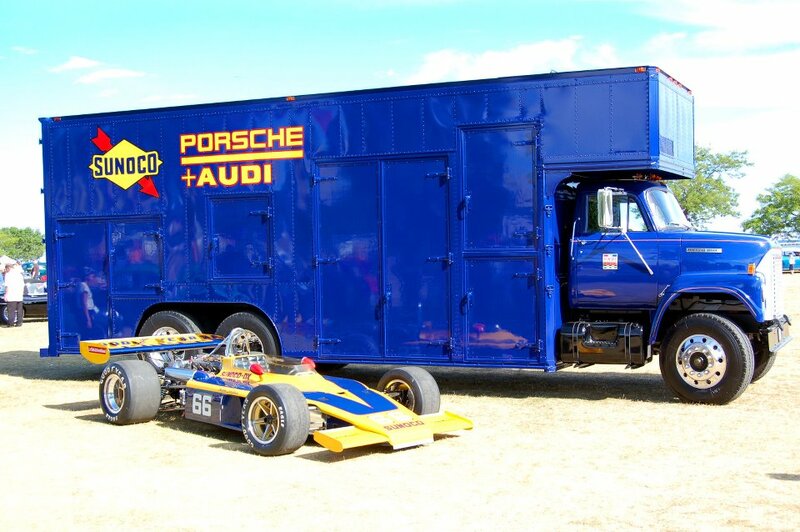 KMPR presented its 1972 All American Racers Indy Eagle #7225 and 1972 International Fleetstar 2110A transporter as a complete 'Tonka Truck' duo in the Vintage Race Cars class. The team came away with a class victory in their hometown Concours, which was great way to start off the Fall Concours season. 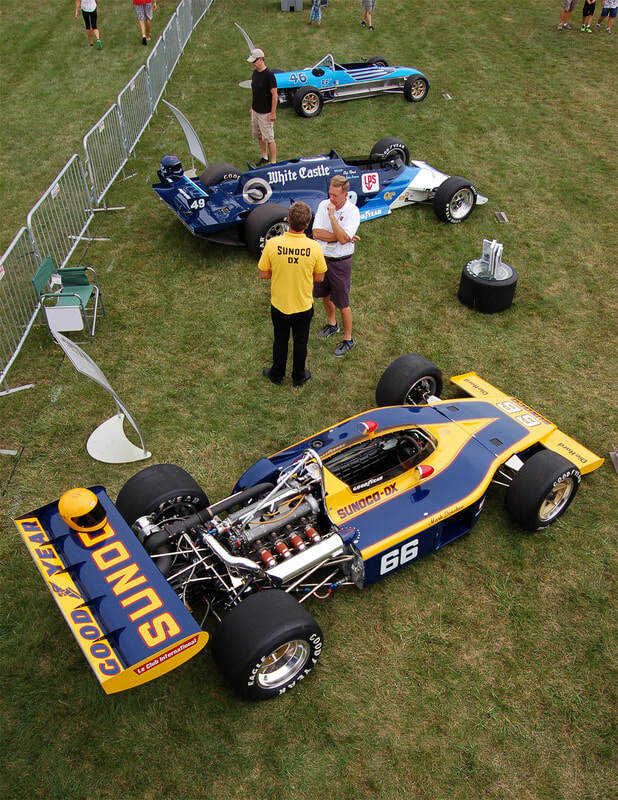 The 2010 edition of the Mark Donohue Tribute Reunion took place in Elkhart Lake, Wisconin, home of the Road America racing facility. 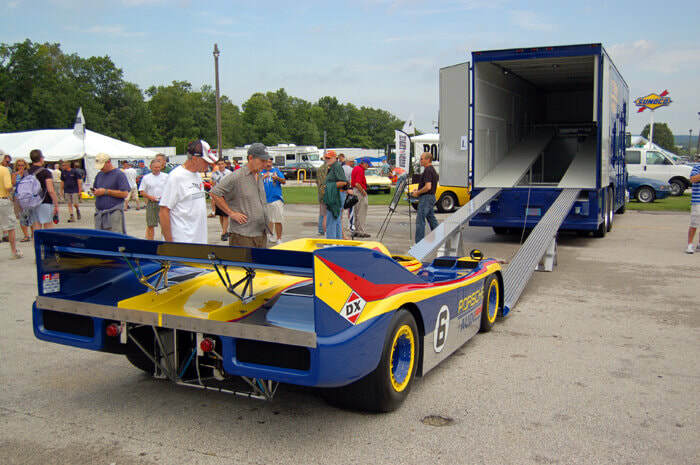 The event coincided with the HAWK Vintage Races and was the feature of the event, which attracted close to 20 crew members who worked with Donohue, 14 of his former race cars and a transporter he helped design to carry the Porsche 917-10 cars. 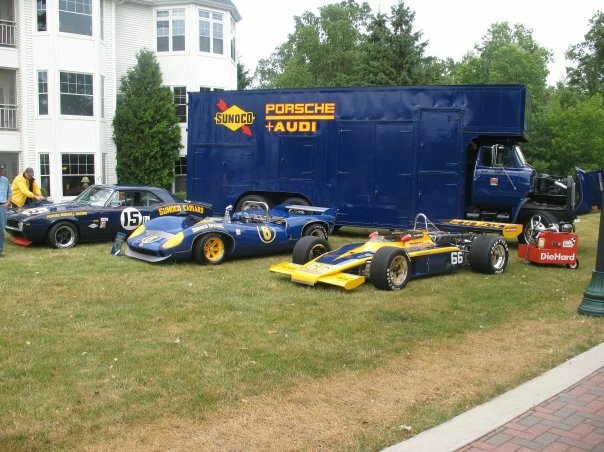 To add to the fun, KMPR's transporter, mentioned above, managed to win Best in Show at the Road & Track Concours d'Elegance, which delighted the former Penske crewmen to no end to think that a truck that they often hated in the day could win a Concours event against million-dollar race and street cars. 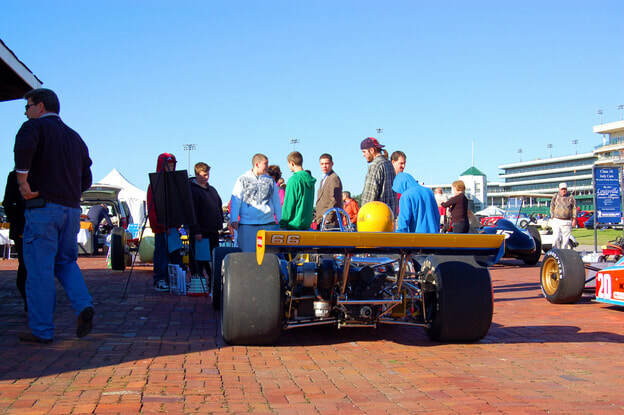 KMPR also had its 1972 All American Racers Indy Eagle #7225 on-hand for the weekend, including on-track for a session. While it did not place in the Concours, we were more than thrilled to have its 'big brother' win Best in Show. 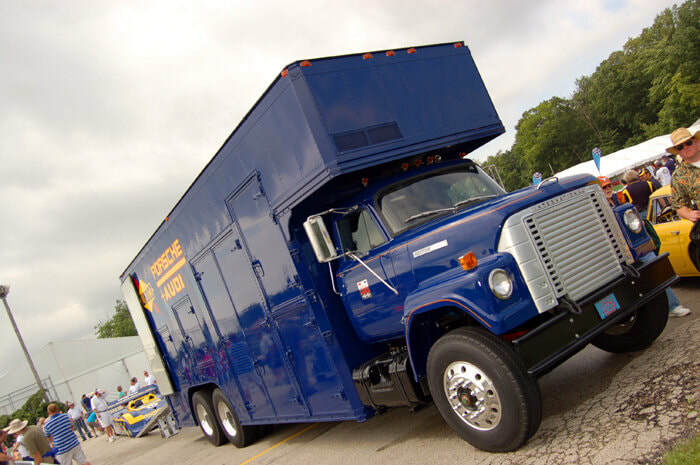 KMPR's 1972 International Fleetstar 2110A debuted at the 2009 Road & Track Concours d'Elegance after a three year frame-up restoration. 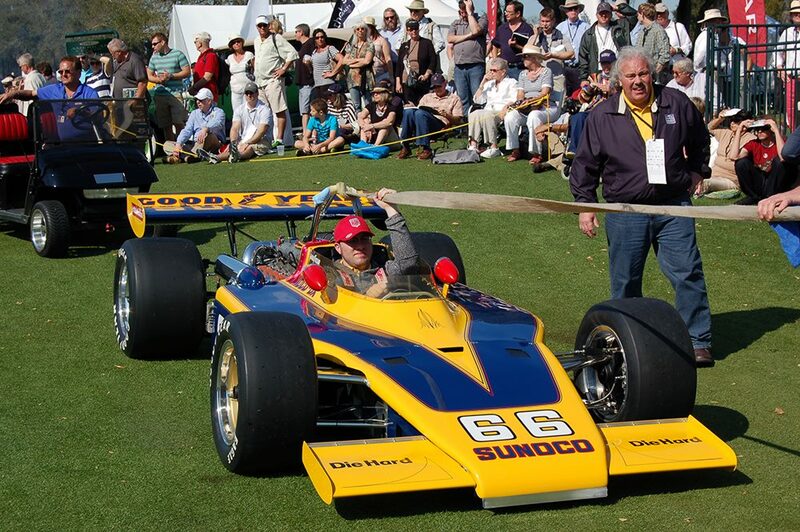 The truck was shown on the lawn of the Osthoff Resort, along with KMPR's 1972 All American Racers Indy Eagle #7225. While the two vehicles showed well under drizzling skies, it would be a year before the truck showed its true colors as a show-winner. The 2007 Road & Track Concours d'Elegance was held in Elkhart Lake, Wisconsin during the Brian Redman International Challenge. 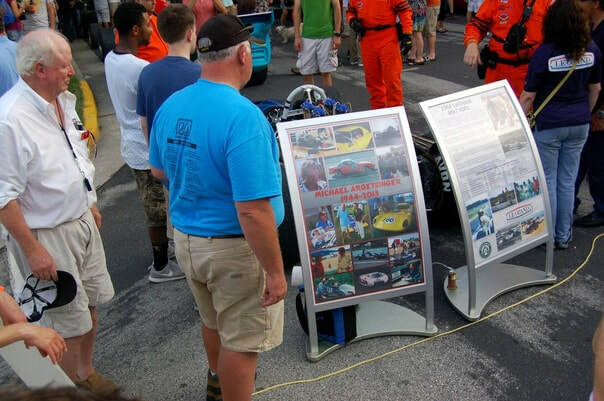 The KMPR crew came out in full and shared the history of 1972 All American Racers Indy Eagle #7225 with the giant crowd. A great time was had. 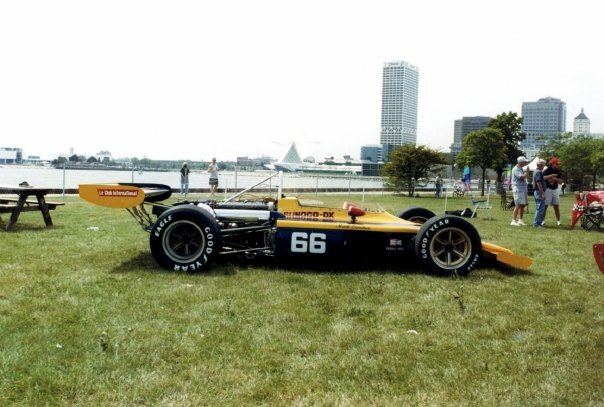 KMPR and its 1972 All American Racers Indy Eagle #7225 came to the 2006 Masterpiece Speed & Style Showcase on the Milwaukee Lakefront with unknown expectations. The Masterpiece was the team's first true Concours-specific event, and #7225 showed well against the backdrop of Lake Michigan. 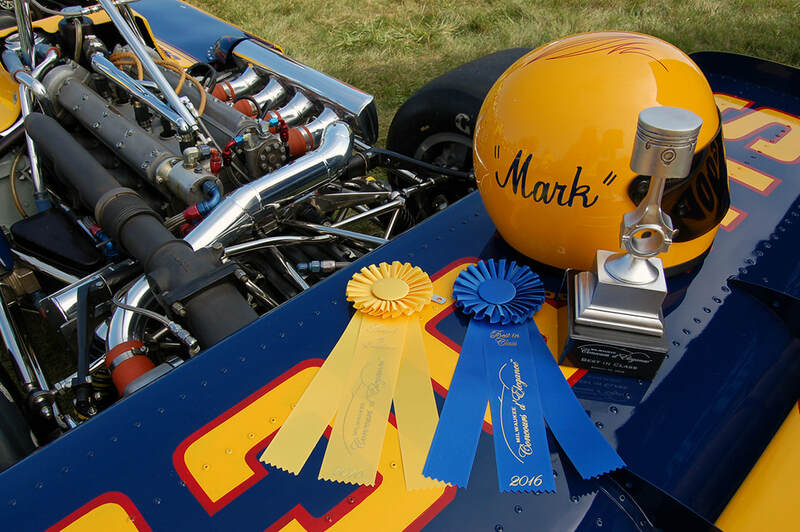 The car took home second-in-class behind a 1931 Miller V-16 that formally belonged to Chuck Davis. It was extremely hard to argue with that placing. The 2006 Road & Track Concours d'Elegance was the first Concours d'Elegance for the Kettle Moraine Preservation & Restoration squad. 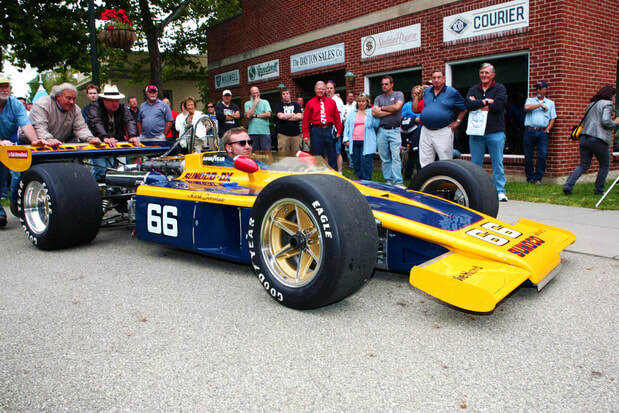 The team debuted its freshly-restored 1972 All American Racers Indy Eagle #7225, complete with its 1973-spec AAR Eagle wings built by AAR fabricator Mike Lewis.